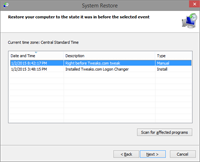 The System Restore feature has matured over the years into a very valuable tool for any enthusiast who tweaks their computer. Every time you make a change, there is a risk that something could go wrong. Wouldn’t it be nice if you could easily undo any change with just a few clicks? System Restore provides the solution to that problem by enabling you to jump back in time to an earlier state.